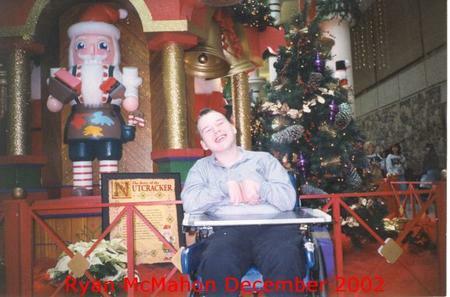 Since he suffered a brain injury almost 13 years ago, our son Ryan, now 21, has not been able to walk or talk. But he does communicate with his eyes (I know it's kind of a cliche, but it's true) and via his laughter. Just very recently he's started doing another trick: I put my hand on top of his, then he will think and think and think and then move his hand out from under mine, and then put his hand on top of mine. Why is he able to do this now? I really don't know. Maybe there was some Magic in those postcards from England sent by Nigel and Sally. All I know is, you would think it's pretty neat too if you had been waiting 13 years for it!